Top 5 Best LED Nail Lamps of 2019: Do NOT Buy Before Reading This! Gel nails look good. They protect your nails, and they won't chip or scratch. Gel nails are durable and should last at least two weeks before nail growth makes it necessary to redo them. 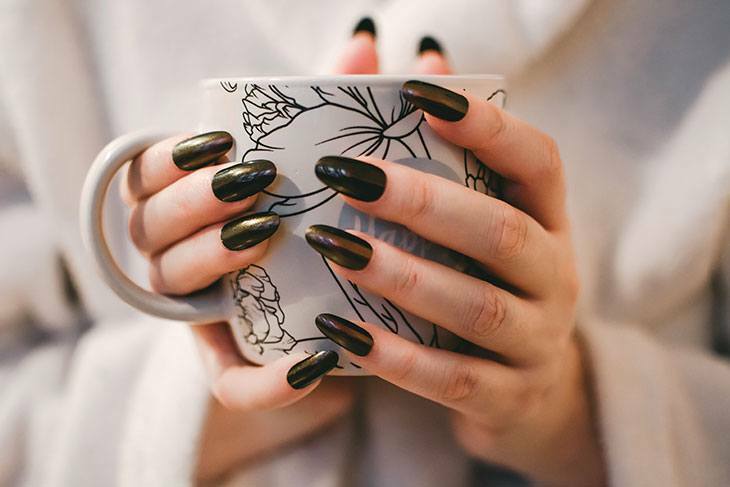 Whilst most of us love to show off beautifully manicured nails, regular salon visits can be costly and time-consuming so why not do your nails at home? All you need is the best LED nail lamps that you can afford, the gel nail kit and cleaning alcohol. Self-application of gel nails is not difficult, and it is fun, an outward expression of your creativity. In recent years the patterns and colors for gel nails have become increasingly more inventive. Gel nails, unlike other nail coatings, must be cured using either a UV lamp or an LED lamp. The gel is an epoxy that contains photo-initiators (1) which require light exposure to activate and harden. READ MORE: The Best Hooded Hair Dryer 2019 – Style Quickly, Look Pretty! Best Nail Lamp UV or LED? You may be wondering what’s the best nail lamp UV or LED. Years ago, there wasn’t much choice. UV lights were used to cure almost all gel nails. When LED lights first came out, they were costly, but as they have become more popular the prices have dropped, and today they are quite affordable. At fifty thousand hours of use, LED light bulbs last five times longer than UV bulbs. UV bulbs must be changed based on time used. Stale bulbs do not cure properly and can result in a nail finish which will not last. Although they have dropped in price, LED lights are still more expensive to buy. They cure the gel nails a lot faster than the UV lights do, and they also use less power. Unlike UV lights, LED lights stay cool. Maintenance of LED lights is easy and inexpensive. LED nail lamps do have downside they don't cure all nail gels, and you should check the gels for compatibility before you decide to buy them. In my view, the best LED gel nail lamp outstrips the UV lights in advantages, and I would pay the small price premium for the curing speed and maintenance benefits of these lights. They are simple to operate. You simply place your hand under the lights, push the timer, and within seconds the gel has cured, and you can do the other side. The number of light bulbs – the more LEDs the lamp has, the faster it will cure your nails. Timers – most curing machines come with timers. Make sure that the one that you purchase has more than one timing option. Three timing options will give you far greater flexibility. Sensors - some of the best LED nail curing lamps feature sensors that automatically switch on when you insert your hand under the lights and switch off when you remove it. Toenail option – if you apply nail gel to your toenails, you'll want to use the machine to cure them too so you’ll want to buy one that offers this option. Most pedicure capable lamps have a removable base. Price – when you decide to buy a lamp for gel nails you should have a budget in mind. How much you are prepared to spend will often depend on the purpose for which you are buying it. If you are purchasing it for a salon, you will expect to use it frequently and will probably look for a top of the range model. For home use you may opt for the best budget LED nail lamp. Prepare by washing your hands and buffing and shaping your nails. Lay out all the items that you need for the procedure. Each hand should be done separately. Each must receive a base coat and then the hand should be placed into the nail lamp for sixty seconds. Without touching the cuticles, apply the first color gel to the base coat and place under the lights for another sixty seconds. Repeat with another layer and then a top coat. Each layer should be dried under the lights for sixty seconds. When the last coat has dried wipe the nails with a cotton wool ball that has been soaked in Isopropyl Alcohol, to clean off the sticky residue. 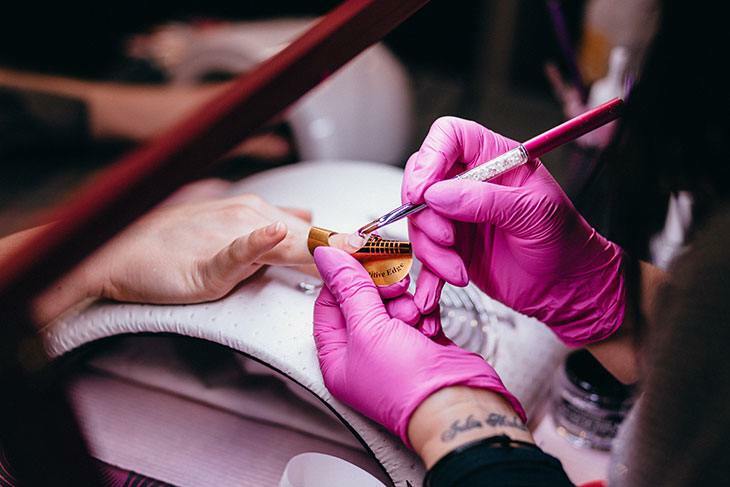 It is crucial for gel nails to cure for the correct period as under curing will cause chipping whereas over curing will cause the nails to shrink and curl up at the edges. Read the instructions on the gel and the manual that comes with your LED lights as times may differ. 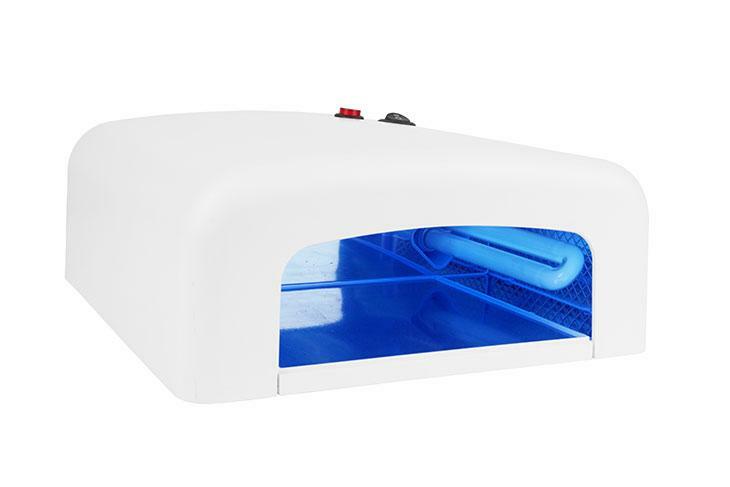 The Gelish 18G is my choice for best nail curing lamp for salons. It is relatively expensive but it cures quickly and has a host of excellent features. The top feature of this lamp is its speed. It takes five seconds to cure the base coat, between twenty and thirty seconds for each of the color coats depending on how dark the color is and twenty seconds for the top coat. A motion sensor activates the lights. They switch on when you place you place your hands or feet into the drying cavity. The machine beeps to signal that it has switched on or off. It is pedicure capable and is large enough to cure both hands or both feet at once. The magnetized base plate removes easily for sanitation. The nail lamp has eighteen 2-watt LED lights, so it uses 36 watts of electricity. And, the display timer is pre-set and has a countdown. It has three timing options. The reflective inner surface has finger stoppers ensure correct finger placement for the perfect gel finish. Also, the surface is acetone and scratch resistant. The Gelish G18 has a patented eye shield which slides down your hand preventing the light from escaping and damaging your eyes. Although designed specifically for the Gelish Soak Off Gel, this nail light can be used to cure other nail gels. The lamp meets worldwide safety requirements. The one downside of this machine is that it has no off-switch and must be switched off at the wall. If you’re planning to do your nails at home, the NailStar could be just what you are looking for. It is inexpensive, simple to use and it has a few useful features. With sixty LED lights, this LED lamp uses just 12 watts of energy. It has four timing options 30 seconds, 60 seconds, 90 seconds and 30 minutes with a countdown timer. The length of time required for gel nail curing depends on the make of the gel, and the thickness of the layers applied. The machine is pedicure capable, and is compact and light, easy to move around. Because it has no lights on the side the thumb must be cured separately. It comes with a full instruction manual to help you to obtain the best home manicure/ pedicure, ensuring that your nails are salon perfect. It also has an AC/DC power adaptor. And, it has a one year warranty. On the downside the machine has no sensors, one wonders then why it has a thirty-minute setting. With its USB outlet, this is the perfect travel companion. Charge it in your car, on your laptop or power bank. Its light and compact design will take up little place in your bag. The lamp is also inexpensive which is why it gets my vote as best budget LED nail lamp. The Beatunes uses only twelve watts of electricity. It has four finger grooves that ensure that your nails are ideally placed for quick setting, perfect salon nails. The slots also provide that your fingers do not inadvertently make contact with the lights. This lamp only has space for four fingers so it will take a little extra time and if you intend doing gel pedicures, this machine won't be suitable. The inside surfaces are made from reflective materials to enhance the curing efficiency. The machine has three pre-set buttons at thirty, sixty and ninety minutes so that you can set the time according to the gel that you are using. And, the product comes with an AC/DC adaptor, a USB/DC cable and a guide to help you make optimal use of the lights. It has a twelve-month warranty. Finger grooves ensure that fingers stay safely away from the heat source. MelodySusie is a leading brand in the manicure industry. It is a US company with a good reputation. MelodySusie makes many LED and UV nail lights with different features and at different prices. This lamp is good enough for a salon and inexpensive enough for home. It is a surprisingly inexpensive lamp that comes in a choice of three colors black, pink or white. The inside walls are reflective for more efficient operation. The lamp has been pre-set with four options thirty seconds, sixty seconds, ninety seconds and thirty minutes. Set the light according to the requirements of the gel that you are using. This machine features particularly useful heat control. It will prevent overheating that could result in damage to the gel nail surface. Although compact, there is plenty of room to fit all five of your fingers in at once and It is pedicure capable. It is equipped with sixty LED lights and uses twelve watts of energy. It comes with an AC adaptor and is covered by a twelve-month warranty. This large LED nail light is big enough to accommodate both hands or both feet, but small enough to carry around. It has a relatively small footprint, so it does not take much space. It is also surprisingly inexpensive which is why it gets my vote for the lamp which offers the best value for money. The lamp has twenty-four LED lights evenly placed along the top of the machine. It uses 48 watts of electricity. There are two settings at the maximum power, thirty seconds and sixty seconds and one of the ninety-nine seconds on low mode for sensitive skins. The LED display will countdown the curing time. Despite the large opening, the shape of the lamp prevents light spillage that could harm the eyes. It is molded from durable ABS plastic. Infrared sensors will cause the lights to come on at low power when your hand or foot is inserted into the light cavity and will switch it off again when you remove it. This machine has a double light source, and you can switch it over to UV if you are using a brand of gel that does not respond to LED lights. If you long for beautiful nails and don’t have the time to sit around in a beauty salon, embrace your creativity and start pampering yourself at home. In this collection of best LED nail lamps, there is one that will fit your budget and still offer you the features that you seek. How to Get Amazing Results From a Bleach Pregnancy Test?